Chocolatey is Participating in Hacktoberfest! Recently we tweeted about participating in Hacktoberfest. Hacktoberfest is a celebration of open source by contributing code. Folks interested in contributing must submit 4 pull requests in the month of October to any participating issues. You must first sign up (register with GitHub) to participate. You can do that at https://hacktoberfest.digitalocean.com/sign_up/register. Best of all, when you submit those 4 pull requests, you qualify for a free T-Shirt from Digital Ocean. So while you may not be familiar with C#, you may be familiar with PowerShell. If you are not familiar with either but you know Chocolatey inside and out, we always have a need for better documentation. Suggest some more things that you want to work on. We might even label them with Hacktoberfest! 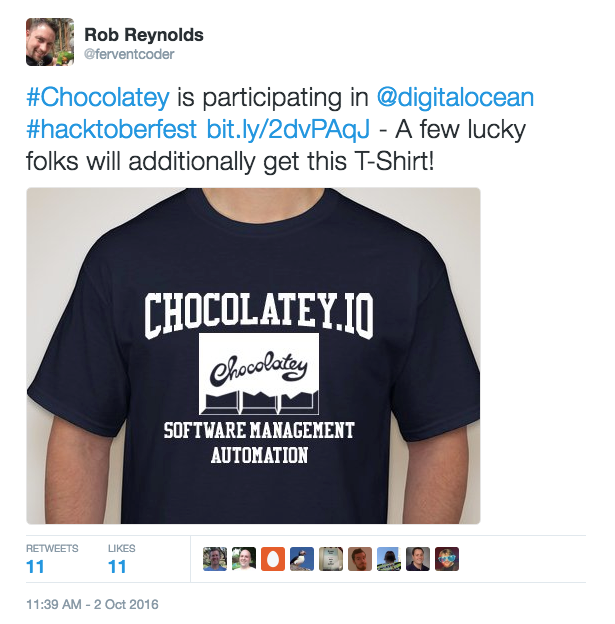 If you participate in Hacktoberfest and you contribute to Chocolatey, you may be eligible to win a second T-Shirt. How do I win a Chocolatey T-Shirt? You must submit at least one pull request to the choco GitHub repository based on one of the available hacktoberfest issues during the month of October. You must submit a total of 4 pull requests to qualify for #hacktoberfest participation. There must be a total of at least 5 pull requests submitted to the choco repository from 5 different folks during the month of October that are based on issues with the hacktoberfest label. Pull requests to choco should show they have met the CONTRIBUTING guidelines to be eligible for the shirt. Every eligible pull request counts as an entry. An individual submitting 3 pull requests to choco during the month of October will have three entries in the drawing. For each 10 unique individuals issuing pull requests to the Chocolatey GitHub repository, an additional shirt will be given away. Drawing will be done at random in November. Not available to employees of RealDimensions Software, LLC or their immediate family. We reserve the right to limit the total number of giveaways. We reserve the right to determine eligibility for the Chocolatey T-Shirt. Winners agree to using an image and their name in a future blog post. Let's see what you can do! Let's get Chocolatey! Deployed from e27d7a207f. You are on web.3. Page generated 20 Apr 2019 04:42:44 +00:00.